As goalkeeper for Dulwich Hamlet Football Club from 1912-1925, Ernest Herbert Coleman could easily have been referred to as the Dulwich Diverter. After all, as custodian, it was his job to deflect and turn aside all attempts on goal, diverting the ball from entering the Hamlet net. On the other hand, the modern day Dulwich Diverter is a free community magazine that can be picked up at dozens of stockists in and around Dulwich, including Sainsburys, Chener Books, Village Books and the Dulwich Library. Copies are also available at the Dulwich Hamlet ground. 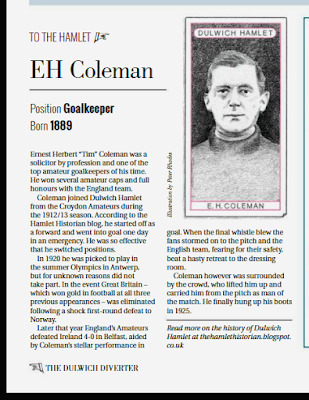 The latest issue features a brief article on Coleman. Our grateful thanks for name-checking this very blog. 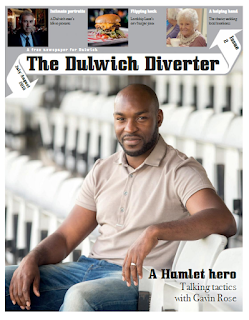 An earlier issue contained an interview with Dulwich Hamlet supremo and cover star Gavin Rose.